When it comes to roommate rentals, landlord tenant law is as confusing for roommates as it is for landlords. That was evident in a recent eviction in British Columbia, a case that highlights how complicated the law can be when it comes to co-tenants. In that case, three tenants entered into a written lease agreement as co-tenants — meaning each was on the lease agreement and liable for paying rent. At the end of the original lease term, the tenants stayed on, and the tenancy became a month-to-month. About six months later, one tenant provided the landlord with written notice of to terminate the tenancy. A dispute arose over the consequences of the termination notice. The landlord interpreted the notice to termination by one tenant as a termination of the lease agreement, and served notice to vacate on the remaining tenants. The exiting tenant objected, claiming it was her understanding that only she would leave and the others could remain. In siding with the landlord, the tribunal clarified that, where a co-tenant gives proper notice to end the tenancy, the tenancy agreement will end on the effective date of that notice, even where the notice has not been signed by all tenants. The remaining tenants were ordered to vacate. However, had the remaining tenants continued to pay rent, the tribunal warned that the parties may have found that they had entered into a new tenancy agreement which would not include the exiting roommate. This could have consequences for the landlord with respect to the security deposit and the ability to collect damage or unpaid rent from the previous tenant. That means leases, especially those involving co-tenants, should always be in writing to clarify the parties’ intentions. 1. Roommate situations can pose a danger if someone who is not qualified is attempting to hide behind someone else’s rental history. Perform a tenant background check on each adult applicant. This requires obtaining separate rental applications from each proposed co-tenant. 2. Make sure each adult signs the lease agreement. 3. Use a lease agreement that fits the co-tenancy. For instance, the form should contain enough signature lines, and likely will include provisions regarding joint and several liability. Seek legal advice if you are not certain about your lease. 4. Don’t account for separate or apportioned rent or deposit payments. 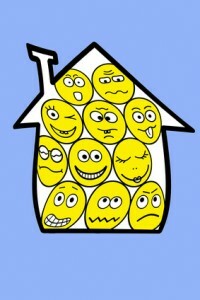 That can lead tenants to believe that they are acting independently of one another. 5. Never agree to allow one roommate to leave or a receive a partial return of the security deposit without first seeking legal advice to determine the consequences.